Dicentra is one of the early flowering perennials in Spring. It is a plant which did not lack in grand-grand mothers garden and it may not lack in today’s gardens too. The foliage is quite attractive; the flowers are extremely elegant. Each Spring the plants show rows of hanging, heart-shaped flowers on bent, curving and arching stems. The common name ‘bleeding heart’ refers to its flowers that resemble hearts with drops of blood(white) falling from them. Dicentra is a genus that some say, belongs to the Fumariaceae family, while others include Dicentra in the Papaveraceae family. Fumariaceae refers to the Latin word fumaria which means, fume or smoke. The story says that the name fumaria was given to a plant, because people in ancient times, when the plant was named fumes terrae(smoke of the earth), believed that the plant came into being by smoke, arising from the earth. However, Plinius in his book HISTORIA NATURALIS claims that fumariarefers to the sap of the plant, which formerly was used to clear up the eye-sight, causing running; watering eyes.(tears). It is also said that the plant belongs to the fumariaceae because its fine, curving blue grey leaves resemble to a crinkling cloud of smoke. 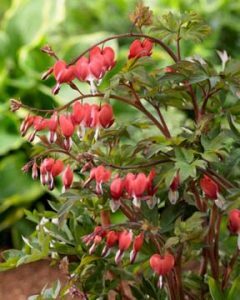 The name Dicentra derives from the Greek words dis…which means twiceand kentron which means spur. The flowers bear two spurs. Botanist distinguish 20 species of which 9 varieties are cultivated. 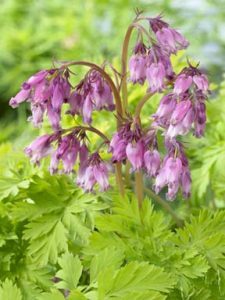 The most well-know species Dicentra spectabilis however, is, according to Mark Tebbitt; Magnus Lidén and Hendrik Zetterlund, authors of the book BLEEDING HEARTS; CORYDALIS AND THEIR RELATIVES, wrongly named. 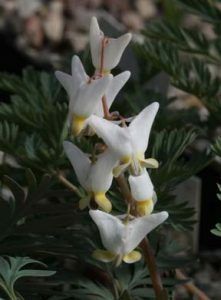 Due to serious genetically research on chromosome level, the genus Dicentra has been splitted in 5 genera. Dicentra spectabilis belongs to the genus Lamprocapnos and correctly must be named Lamprocapnos spectabilis. There are four bulbous species of Dicentra. Dicentra Canadensis; Dicentra cucullaria; Dicentra pauciflora and Dicentra uniflora of which only Dicentra Canadensis; Dicentra cucullaria and Dicentra pauciflora are in cultivation. 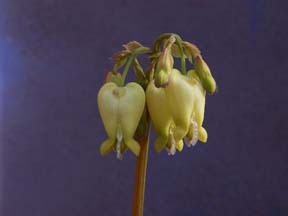 The bulb forming Dicentra’s are endemic in North-America. The well-known explorer Dr. Janis Ruksans from Latvia cultivates small quantities of bulbous Dicentra. Janis made a lot of exploration trips all over the globe for collecting wild species of all kind of bulbs. 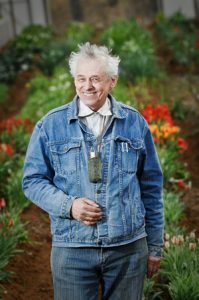 His collection of wild Crocus is world famous. In his book ‘Buried Treasures’ issued by Timber Press in the United Kingdom, Janis describes his exploration trips and the species he found in an inimitable, unparalleled way. 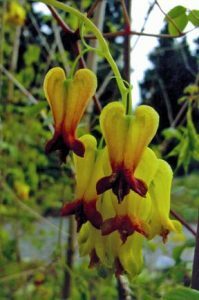 I am going to write more about Janis Ruksans and his breeding work in Corydalis, in a separate article. Dicentra canadensis . Common name: Squirral-corn. Canadenis refers to the word Cánadawhich does not mean the country Canada, but a part of the north of North-America where Dicentra canadensis was found. Canada or Canata has been taken from the language of the old Indian natives and means ‘hut’. The very first Europeans, who visited this part of the world wrongly thought that ‘the natives’ meant with Canada the name of their country. Dicentra canadensis produces a cluster of yellow small bulbs of 2-6mm long, changing into red when aging. In 1830, a certain Mr. Cleghorn had sent some bulbs of Dicentra canadensis to the Glasgow Botanic Garden of Scotland which brought it into cultivation and it has been spread over Europe since. Dicentra Canadensis needs shallow planting and like more shady conditions. Dicentra cucullaria. Common name: Dutchman’s breeches. 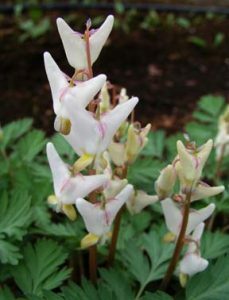 It is called Dutchman’s breeches because its flowers, with their diverging basal spurs, resemble the baggy pantaloons worn by the 18th-century Dutchmen. An alternative name, stagger weed, alludesto the toxicity of this plant to livestock. Dicentra cucullaria was used in a treatment of syphilis and as a blood purifier. All parts of this species contain high levels of toxic alkaloids. Cucullaria derives from the Latin word cucullus which means: roof. The two outer petals at the base are roof shaped. Janis Ruksans says: Dicentra cucullaria is a charming and hardy woodland plant with white, creamy tipped up to 2cm long flowers and much divided silvery grey foliage of 20cm high. Dicentra cucullaria is an easy grower and can bear full sun. Dicentra pauciflora Common name: Few-flowered bleeding heart. This species is endemic in the high altitudes of the North Coast Ranges of southern Oregon and northern California(USA). Pauciflora derives from the Latin words ‘paucus’ which means ‘little’, and the word ‘floris’ which means ‘flower’; a species showing little flowers. The species firstly was described in 1880 by the Harvard University botanist Serano Watson and became into cultivation around 1950. It is a rarely offered, nice Bleeding Heart with slightly pinkish flowers. Dicentra uniflora. As I have no picture of this species and besides it is not in cultivation, I will not describe this one. Dicentra eximia. Common name: Fringed Bleeding Heart; Wild Bleeding Heart or Turkey-corn. Eximia derives from the Latinwords ex and emêre and means: excellent. Dicentra eximia is found in the North-American States Penmsylvania; Tenessee and North Carolina. In nature, the flowering season lasts from mid Spring to early fall, but in gardens it often blooms till the first frost. It has deep-rose pink buds open to pale-pink heart-shaped blossoms and ferny, grey-green foliage. Dicentra eximia was introduced in Europe in the 19th century by a certain Mr. Lyon, who got it from the States. In 1815, it was listed and illustrated in The Botanical Register under the synonymous name Fumaria eximia. Dicentra eximia has a fleshy, creeping rhizome and needs sufficient space in the garden. 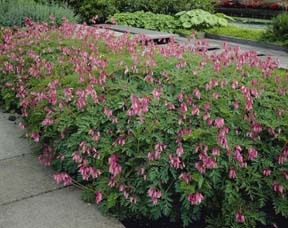 It is the most heat tolerant one among the herbaceous Dicentra species. There is one pink-pale flowered selection, named Dolly Sods, introduced by the American company Plant Delights Nurseries. The varieties Bootman’s Variety and Stuart Boothman are hybrids and crossings between Dicentra eximia and Dicentra formosa. Dicentra formosa. Common name: Pacific Bleeding Heart. Formosa comes from the Latin word forma which means: beautiful, having a fine, beautiful appearance. It is native in North-America. Landscapers say that Dicentra formosa is a wonderful garden pant, which, if periodically dead-headed and given sufficient soil moisture, will bloom in waves from April until the frost, with a peak flowering in late Spring. Dicentra formosa was discovered by the Scottish surgeon and naturalist Archibald Menzies while serving with Captain Vancouver on a discovery’s voyage around the world. He collected seeds, and, when returning in England in 1795, he presented the seeds to the Royal Botanical Gardens Kew. Dicentra formosa soon was widely cultivated and followed by valuable hybrids. The most known hybrids of Dicentra formosa are: Dicentra Adrian Bloom having ruby-red flowers and blue green foliage; Dicentra Aurora having white flowers and grayish foliage; Dicentra Bacchanal has dark red flowers and large grayish foliage while Dicentra Luxuriant has cerise pink flowers and spring-green foliage and is quite vigorous.Dicentra formosa Spring Gold has yellow foliage in Spring and Dicentra formosa Spring Magic makes a compact mound of finely-cut silver foliage topped by pendent soft-pink hearts on upright stems. Dicentra oregana. Common name: Western Bleeding Heart. Oregana means: for the first time found in the North-West State Oregon(USA). Dicentra oregana, actually is a subspecies of Dicentra formosa. Dicentra formosa has pink to pinkish-purple flowers and green leaves, while Dicentra oregana has cream or pale-yellow flowers and blue-green leaves. It is shorter in stature, about 25cm high. This species was distributed in Europa in the 20th century and firstly offered in England around 1932. It is still relatively uncommon today and difficult to grow, although it has been important in hybridization. Dicentra oregana is a typical collectors item, and so far, no named varieties are known. Dicentra peregrina. Peregrina comes from the Latin word peregre…. per and ager and is Latin for ‘immigrant’, possibly because the species is the only one of its genus outside of North America. Dicentra peregrina is the sole Asian representative of the genus Dicentra. It is widely spread and endemic in north east Siberia; Kamchatka; Sakhalin Islands, the Kuriles and Japan. 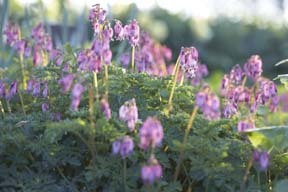 The species Dicentra peregrina is highly regarded by Japanese growers and is the symbol of the Tokyo Rock Garden Club. In Japanese, the plant is named kusakoma; kusa for the buds, which look like the head of a horse(koma). Dicentra peregrina, mostly is raised from seed. Dicentra peregrina often has been used in hybridization by American and Japanese growers, by using the species eximia and formosa in order to get better growing and stronger varieties. Dicentra scandens, Climbing Yellow Bleeding Heart. Common name: Golden Tears Vines. Scandens derives from the Latin word scandêre which means: climb or climbing. Dicentra scandens sometimes is listed as Dicentra thalictrifolium because the shape of the leaves looks like the foliage of Thalictrum. Dicentra scandens is native in the Himalayas of Nepal and Tibet and ‘garden lovers’ who have it in their gardens are very enthusiastic about this species and recommend it as a ‘must have’ to every self-respecting hobby gardener. This species also inspired poets to poeticize it. Dicentra scandens is a long flowering species. The first blooms appear in May and continue until Autumn, an extraordinary bloom period for a perennial. Once started up a post, a shrub or a window screen, it will clamber effortlessly to a height of over 2 metres. It tend not to be very frost tolerant but, when it dies back in Winter, mulching the tuberous roots should increase the chance of survival. Once established, however, it continuously blooms all summer long and until first frost. Flowers turn into reddish bean-shaped pods that are themselves very interesting. There is one selection, named ‘Athens Yellow’ by Allen Armitage. Allen admired Dicentra scandens in the Dublin Garden of plants woman Hellen Dillon. He took some seeds with him to the USA and when they began to bloom, some plants displayed blooms of deeper yellow than the parent. He called this selection ‘Athens Yellow’. It is vegetative reproduced by taking cuttings and available in the USA. Dicentra spectabilis. Common Bleeding Heart. Spectabilis refers to the Latin word spectäre which means: worth seeing; pretty; fine. In my introductory I already mentioned that, due to ‘serious genetically research on chromosome level, Dicentra spectabilis was renamed into Lamprocapnos spectabilis’. Lamprocapnos is derived from the Greek lampo which means ‘bright’ and capnos which means ‘smoke’…..bright smoke. It is a reference to the showy flowers of this genus. Despite the change of the name of the genus, today it is still offered and sold as Dicentra spectabilis since it has been known for 150 years under that name. It has become the most popular species of the genus Dicentra. It is easy to grow and very long lived. Dicentra spectabilis is native in Korea; Manchuria; China and Japan and long before it was known by Western gardeners, this plant already was cultivated by the Chinese and Japanese. It was the Scottish plant collector Robert Fortune who, successfully introduced Dicentra spectabilis in England in 1846. The popularity of the Common Bleeding Heart is immense and, according to Dr. Magnus Liden from the Uppsala University Botanical Garden in Sweden, in his country Dicentra spectabilis is known as ‘the heart is hiding’ which is a reference to the resemblance of the dissected flower parts to ‘a woman, a bottle and a gun’ all of which are supposedly found in the ‘heart of a lieutenant’. The Chinese suggest that the individual flowers look like ‘a fish that has a smaller fish in its mouth’. The Chinese also translate the name, according to the above mentioned Robert Fortune, into ‘red and white moutan flower. Moutan is Chinese for tree peonies, and the name refers to the similarity between the leaves of Bleeding Heart and the leaves of tree peonies. 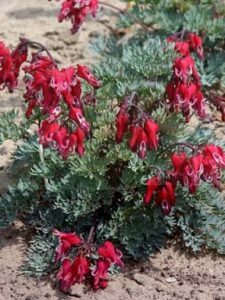 The Authors of the book Bleeding Heart; Corydalis and their relatives(see introductory) wrote a funny story about Bleeding Heart. So the story goes: “the distinctive appearance of the plant also inspired Edward Lear, who is better known for his nonsensical limericks, to publish in 1871 a drawing of the fictitious plant ‘Manypeeplia upsidedownnia’; many people upside down. This nonsense plant is clearly a Bleeding Heart with little people replacing the flowers”. Dicentra spectabilis Gold Heart has pink flowers and golden-yellow, deep-lobed foliage. It is a contrasting eye-catching and eye-pleasing variety. Dicentra spectabilis Valentine, is a rather new hybrid and is an unusual selection of the Old Fashioned Bleeding Heart. This features arching spikes of cherry-red flowers with white tips held on dark burgundy stems. The ferny foliage becomes dark grey-green when it matures. Dicentra spectabilis Valentine was bred by the Canadian couple Lyle and Phyllis Sarrazin. Dicentra spectabilis is not only a perfect cut flower, but displays well on pots too. In the United States of America it is offered for Valentine’s Day, as Dicentra spectabilis easily can be forced in the greenhouse for this purpose. Most varieties of the ‘Dicentra hybrid Heart Series’ were bred by the Japanese breeder Akiro Shiozaki. The nursery of Akiro is situated in the City Fukagawa in the Japanese province Hokkaido. It was Mr. Akiro Shiozaki who successfully crossed Dicentra eximia x Dicentra peregrina in order to introduce a more robust habit while retaining the colour of the foliage. I already mentioned that the species Dicentra peregrina is the symbol of the ‘Tokyo Rock Garden Club’, however, Dicentra peregrina is difficult to grow and to propagate while Dicentra eximia grows very fast. So far Dicentra peregrina is propagated by seed only. 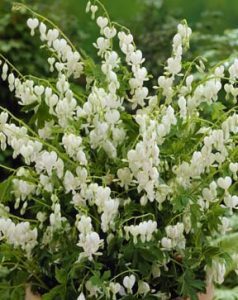 Since Akiro introduced his first cross of Dicentra peregrina x Dicentra eximia, named Candy Hearts, it soon was followed by Dicentra Ivory Hearts and Dicentra Burning Hearts. These new hybrids produce larger and more showy flowers as well. The plants are very heat tolerant and bloom constantly all Summer long besides, they have the bluest fern-leaf foliage of all Dicentra. Candy Hearts has dark-rose flowers; Ivory Hearts has white flowers while Burning Hearts has deep red flowers edged in white. The foliage is bright blue-grey. The latest introduction of Akiro is Dicentra Red Fountain(synonym Dicentra Fire Cracker) a very rich flowering one having green-grey foliage and dark red flowers. Dicentra King of Hearts has similar parentage of the breeds of Akiro Shiozaki, however, it is originated from the USA. Dicentra King of Hearts was bred 30 years ago in the American State Washington by Dr. Marion Ownbey. The flowers are pinkish red. Dicentras in general are shade or semi-shade garden plants. Once established Dicentra does not require special attention but they do not like to be moved from its place.